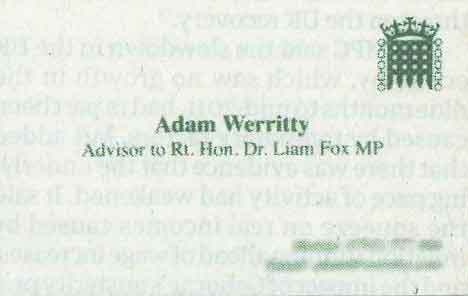 Did anyone else notice anything funny about this picture of Adam Werritty’s business card, as featured in the Daily Mail? No? Just me then. Was anyone else so blinded by irrational hatred for tabloid newspapers that they recognised it as backwards text and assumed this to be the result of their scanning it from another newspaper? No? Didn’t think so. Was anyone else so jealous of the professional standard set by the Mail that they spent an entire 2.5 seconds reversing the image to confirm this, and then spent a further 6.8 seconds in Google so they might discover which newspaper the Daily Mail has been lifting material from without credit? No? Well, that’s to be expected. Oh, and it was The Guardian, by the way; the Daily Mail scanned an image for one of their articles from The Guardian, and didn’t bother crediting them. But I’m sure this is one of those perfectly innocent oversights, and the Daily Mail had permission to use the image, which is why they used the high resolution version one can only get from scanning a two-day-old copy of a rival newspaper. 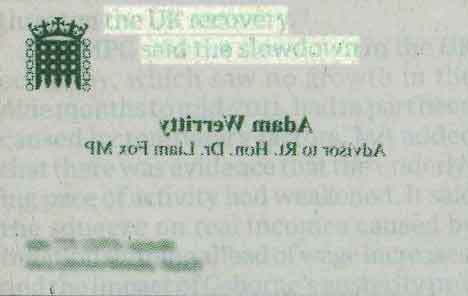 13 Responses to "Daily Mail and the Foxy Knock-Offski"
Well well, Daily Mail, you thieving bastards. Nicely sleuthed Tim! It's not like they have form for anything like this though is it? ha! Great work Tim. Sad thing is, why am I not surprised by this!? What is most surprising about this information is to that anyone at the Mail shows interest in News. You know, Alan Partridge would be outraged. Outraged that you could accuse his beloved paper of such a thing! Dear me, surely it would have been quicker, easier and better to just reproduce it? Not exactly the most complicated design is it. It's a business card – they don't need permisison to reproduce. I'm no fan of the Mail, but this inclination to jump on everything they do is petty. So why comment if you really feel that way? Is it sad that I recognised the Guarniad's font right off the bat?